We don’t stop til we get to the top (with a nod to the late great Casey Kasem)! In at #36, it’s the official entry from Austria, “Limits” by Paenda, written by the artist (under her real name, Gabriela Horn). The song is performed in English, and will be performed 9th on the second semi-final on May 16. Born in 1988, Paenda has studied pop and jazz music for many years, with much of her education coming at the Vienna Music Institute. She writes, produces, and performs all her own music. I’m trying to figure out where to start with this one, because I happen to like the song. It’s not a HUGE contender in my book, unlike a lot of the rabid ESC fandom, who are split between love and loathing for the song, but it’s certainly pretty and deep enough to be a pretty big hit. Again using a lost love as the seeming catalyst for the story of the lyrics, her performance in the video is touching…and yet the static video – just Paenda and her blue hair standing in front of a green screen with images floating behind her – is deadly dull, much like SuRie’s “Storm” last year; decent song, lousy video. I hate it when a lousy video dooms a good song – see 2018’s “Forever” by Alekseev, which was totally RUINED by an incredibly creepy video and doomed to miss the grand final by a lousy live performance. She’s got a shot at making the finals for sure, which will be even stronger if as I suspect she can pull off a terrific live performance, but I don’t think the placement will be as huge as some fans think it will be. Austria made its EuroVision debut on the contests’ first birthday in 1957 and has been around fifty-one times since then, missing years here and there for various reasons. 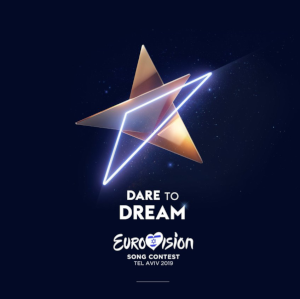 They have two Grand Final championships that were a whopping 38 years apart – 1966’s “Merci, Cherie” by Udo Jurgens and 2014’s instant EuroVision Classic “Rise Like A Phoenix” by Conchita Wurst. But every good side has its bad side too…they have finished dead last in the contest a whopping EIGHT times, with four of those times with the dreaded “nul” points – 1962, 1988, 1991 and 2015, a most “nul” points record they share with Norway. 2018 was their best showing in years, with Cesar Sampson‘s “Nobody But You” finishing third overall. Catch all the official EuroVision action at their official Website and on their official YouTube channel! And hopefully, we’ll get to see the finals again this year somewhere – American fans, with Logo dropping coverage this year, let’s let AXS know we want to see it become the American home of EuroVision!